Woman winemaker/owner Anne Fourcher creates Traditionalist Styled Chateauneuf wines (contrasting with the Modernist Parker style), in an ancient cellar near the center of the famed Southern Rhone village, Cheateauneuf du Pape. Anne took over the winemaking in 2004. The winery is named for a local WWII Resistance Fighter, Count de Lauze, and colleague of Anne’s grandfather. Anne Fourcher makes wines in the Traditionalist style, emphasizing more elegance and restraint. This Traditional style contrasts sharply with the Modern New World/Parker style which began in 1996, in which Robert Parker promoted a model of power and extraction (for bigger, riper, oakier wine).Hand harvested and rigorously field – sorted, her wines are fermented in either cement or stainless tanks with native yeasts and no contact with new oak. With her rock-strewn parcels situated on the north-facing, northern edge of Chateauneuf du Pape north of Mont-Redon, she uses no pesticides or herbicides in her vinyards, following Lutte Raisonée Farming principles. 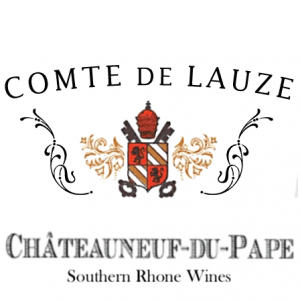 The name Lauze also refers to the commonly occuring flat stones found in the heavily rock-laden vineyards. The wizened old vines are over 50 years of age and are grown without pesticides or herbicides in a slightly cooler, north – sloping terroir that resembles a rock pile, with no visible dirt or topsoil evident. Blended of 45% Grenache Blanc, 35% Roussanne, 10% each Clairette and Bourbelenc , the wine is made with native yeast, no oak and no malolactic conversion. Picking before sunrise for bright acidity, the whites are fermented separately at cold 50˚F temperatures before final blending. Exhibits nice poached pear, white currants, toasted spice and hints of baking bread with a medium – bodied, fresh and lively feel on the palate. 150 cases made. The 70 + year old vines were planted in the 1930s and 40s, emerge from a sea of softball sized rocks with no visible dirt or topsoil . Made with no new oak, native – yeast fermented, the 40% Syrah and 60% Grenache is neither racked nor filtered. Vinified separately using only indiginous yeasts, her fermentation is done over an extetend time at cool 50˚F temperatures in her frigid cellar in underground cement tanks, like Chateau Petrus . Following fermentation, the varietals are blended together and aged in completely neutral, 50 year old Foudre casks before bottling. Opens with splash decant to reveal floral notes, spice and earth , eleg ant red fruits, power and yet restraint. This wine will age easily for a generation or more. 400 cases made .